Finally a complete, “in-tank” fuel system that is truly universal. The Aeromotive A1000 Stealth Fuel Cell is an all aluminum fuel cell with an Aeromotive A1000 Fuel Pump and Filter, built right into the cell itself. Just like any fuel cell, these can be mounted any where, in any car. Simply strap the fuel cell in, hook up your fuel line to the pump outlet and your two wires and you’re done. 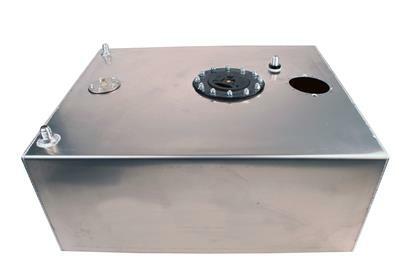 No more searching for a place to mount your fuel pump and pre-pump filter. The Aeromotive A1000 Stealth Fuel Cell gives you an advantage over any traditional fuel system setup. Through an innovative baffling system inside the cell, the fuel pump inlet always has a constant column of fuel. In addition, the baffling keeps fuel at that same point even during extreme driving conditions, making it perfect off-road vehicles, drag racing, even autocross and drifting. This feature alone ensures the longevity and driveability of your fuel pump. Plus, the pump is inside the cell, so noise is drastically reduced and the fuel pump runs cooler longer. The A1000 Fuel Cell is designed to be ideal for both EFI and Carbureted applications for street driving or racing, even if its forced air induction or naturally aspirated. The proper regulator is required depending on your application. Finally a complete, “in-tank” fuel system that is truly universal with the ability to support big power. The Aeromotive Eliminator Stealth Fuel Cell is an all aluminum fuel cell with an Aeromotive Eliminator Fuel Pump and Filter, built right into the cell itself. Just like any fuel cell, these can be mounted any where, in any car. Simply strap the fuel cell in, hook up your fuel line to the pump outlet and your two wires and you’re done. 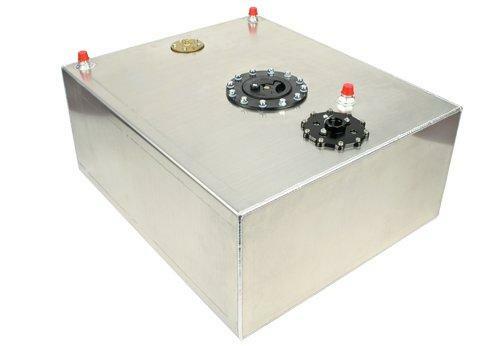 No more searching for a place to mount your fuel pump and pre-pump filter. The Aeromotive Eliminator Stealth Fuel Cell gives you an advantage over any traditional fuel system setup. Through an innovative baffling system inside the cell, the fuel pump inlet always has a constant column of fuel. In addition, the baffling keeps fuel at that same point even during extreme driving conditions, making it perfect off-road vehicles, drag racing, even autocross and drifting. This feature alone ensures the longevity and driveability of your fuel pump. Plus, the pump is inside the cell, so noise is drastically reduced and the fuel pump runs cooler longer. The Eliminator Fuel Cell is designed to be ideal for both EFI and Carbureted applications for street driving or racing, even if its forced air induction or naturally aspirated. The proper regulator is required depending on your application.